Fitness trackers are really booming right now. And for good reason. We now live in an age where you monitor and receive important data on your health, all from your wrist. The opportunity is really quite profound when you think about it. Is the Mira Fitness tracker up for the task of monitoring your health? That is what we hope to explore today. This moderately priced fitness tracker has lots of promise but has yet to establish itself to the same extent that companies like Fitbit have. The graduate of Kickstarter features a unique design that will make it both attractive and effective. Let’s take a look at some important aspects of this bracelet to see if it is right for you. 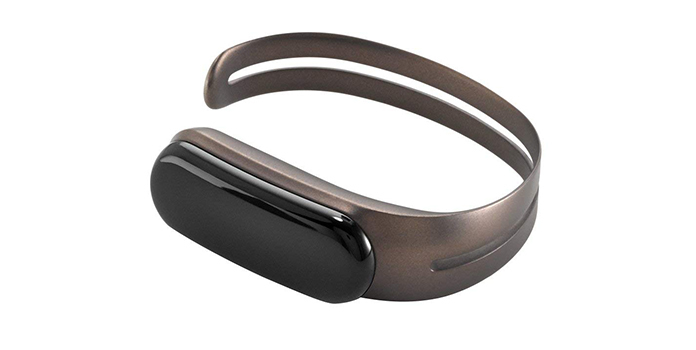 The Mira Fitness Tracker keeps things sleek. The design is compact to the point of being dainty and is one of the few products of this nature on the market that can sincerely double as an attractive accessory in addition to a functional tracker. The ascetics of the band seems to clearly target women. The piece resembles a bracelet more than it does a watch, and could easily be mistaken for a piece of jewelry by the unsuspecting eye. The stainless steel band is cut off before the point of meeting on both ends and resembles a bangle bracelet. There is a display. A small screen of only a few inches that will only light up when you activate a button on the bracelet’s side. The display is simple but gives you all of the information that you might need. This includes your step count, calories burned, your distance traveled for the day, and, of course, the time. Cosmetics out of the way, let’s take a look at how this device actually performs. The Mira Fitness Tracker is regrettably not very weather resistant. Its coating is going to be able to stand up against the moistness of sweat, but not much else. Buyers may want to keep in mind that there are fitness trackers out there that can be used for swimming. This particular option won’t even stand up extremely well to rain. The bracelet isn’t actually the only way that you can use the fitness tracker. If you wish to keep your wrist unburdened, you can clip the “opal” (the name of the tracker component) to your belt buckle if you find that option more suitable. It can also be clipped to shirts, shorts, or really any form of outerwear. You get a pretty standard range of tracking options with this bracelet. It monitors your distance, steps, and calories burned for the day. It also is able to factor in for steps taken up an elevation. There are trackers out there that document a little bit more. One feature that seems particularly popular right now is sleep tracking, which you do not get in the Mira since it doesn’t measure the wearer’s heart rate. How long the battery of this (or any electronic really) will last is contingent on an array of variables, including climate, and patterns of use. The manufacturer advertises a battery life of about five days with normal use, which is consistent with our findings. In terms of market standards, this number is average, to perhaps slightly better than average. The Mira app is the hub upon which all of your data and analytics are collected. The app is available both for IOS and for Android devices. The app represents a centralized location for where you can more readily view a complete depiction of your progress. The app is also where you will be able to go to set fitness goals for yourself. For example, if there is a step count that you would like to hit each day, you can specify that goal within the application. You can also see your activity records from days gone by for a comparative look at how active you are being throughout the course of a week. Unfortunately, you don’t get any analytics about heart rate or diet as of yet, which are both fairly standard features of other options on the market. The app does seem to be on the leaner side, but the relative sparsity does have some benefits. Because the app is uncluttered, finding the data that you are interested in is straightforward and simple. Here is a unique feature: on days where you feel your drive is lacking, the Mira Fitness Tracker is willing to try and help you overcome that. On the bottom of the application, there is a prompt that reads “boost.” When you click on the boost feature you are hit with a small fact that might motivate you to do something healthy during the day. For example, the boost might mention a quick way to add lots of steps to your daily total. The tips are all simple, but for the right person, they could be of help. As you can see, there is plenty to like about this fitness tracker. Does it stand tall against the densely populated world of fitness tracking? That is for you to determine. We would venture to say that there are some departments in which it unambiguously excels. If you are looking for a fitness tracker that puts a big premium on style, you are certainly getting that here. It does lack a few features that we see from other options on the market (like heart rate tracking) but it is ultimately competitive in how it performs as well. Factor all of this in with a very moderate price tag, and you have a product that, at the very least, makes a good case for itself.